Aston Martin DB11 V8 2dr Touchtronic Auto 2019 Review | What Car? 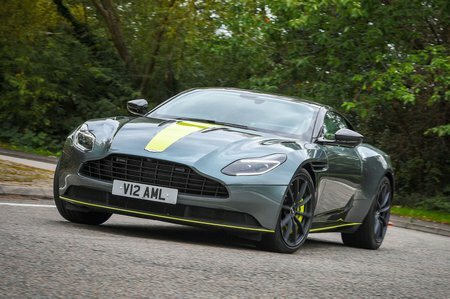 The Aston Martin DB11, particularly the V8 version, is a convincing long-distance cruiser with a sportier bent than its key rivals. If that appeals, it’s a great choice. You get all the luxuries you’d expect for this sort of money, including heated, electrically adjustable leather seats, climate control, keyless entry and start, cruise control, front and rear parking sensors, a 360deg parking camera, a DAB radio, sat-nav, 8.0in infotainment touchscreen, LED headlights and an Alcantara headliner. At 503bhp, this Mercedes-AMG V8 is around 100bhp down on the V12, but makes nearly as much torque at 498lb ft. So it’s still stupendously quick, even if it doesn't sound as good. The key factor is that it’s lighter, by 115kg, which sharpens up the DB11’s handling, especially in direction changes. It’s therefore the engine we recommend.